Preferidos in the wild are most frequently found living in shiny zeppelin-shaped tubes, and this one normally comes in a green one denominated “Emerald.” This one was farm-raised, however, and caught on C-bid for less than half the standard retail price, so no tube. I must admit to one lingering concern about the identity of this cigar — the band reads ECUADOR, rather than EMERALD, as it does on the wild-caught tubed variety. Is the blend the same? I haven’t found any information to the contrary, but I can’t say for sure. The wrapper is unsurprisingly from Ecuador, grown from Sumatra seed. The binder is Dominican, and the filler is a blend of Dominican, Brazilian, and Nicaraguan leaves. How they get all those into this little double-perfecto is a mystery to me, but La Aurora assigns only their most talented (and tourist-friendly) torcedors to the Preferidos line, so they get it done somehow. Preferidos perfectos are produced in two sizes: this one, the classic 5 x 52 No. 2, and also a larger No. 1, at 6 x 58. A few are made in parejo vitolas as well, including robusto, lancero, and most recently a corona size. The Preferidos Ecuador No. 2 is a small double perfecto with two wrapped ends. The foot of the cigar is open, but some smokers like to trim a bit more off to create a slightly larger landing pad for the flame. The wrapper is slightly oily but otherwise unrefined: colorado maduro in color with the widely spaced veins typical of Ecuadorian wrapper leaf. The roll is solid, and the draw is good. Without opening up the foot a little more it can be tough to get lit, but the patient puffer will find this is not necessary. It’s not the size of the dog in the fight, as they say… and this little mutt has more bite than I expected. 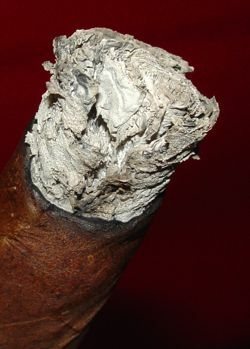 Both ends of the cigar are marked by loads of black pepper. The first part offers some leathery flavors and a hearty meatiness, but the best part is a transitional sweet spot right in the middle of the bulb where the pepper gives way to dark chocolate on the palate and a spicy oak-and-vanilla aroma. Unfortunately the crest of this wave is only momentary and then it’s a quick descent back into black pepper, even more pronounced and one-dimensional on the back end. Compared with other Preferido blends the Ecuadorian entry is a ruffian. Particularly compared to the Cameroon, or even the Corojo, which has potency on display but a little more sophistication. If only that mid-point highlight of chocolate, oak, and pepper could be extended throughout the cigar, I might be won over. Alas and alack, ’twas not to be. And with an MSRP of around $9 to 10 USD, ’twill not be again. Ernesto Perez-Carrillo is best known as the blender of La Gloria Cubana, El Rico Habano, and as the former owner of the El Credito Cigar Company. His father, Ernesto Perez-Carrillo, Sr., had been a tobacco buyer and a member of the Cuban Senate before the revolution. He started the company in 1968, about a decade after he brought his family to Miami. Four years after the company was established in Miami, he acquired the rights to the Gloria Cubana trademark. The young Ernesto was an aspiring musician, and he entered the cigar business on a part-time basis. But when his father passed away in 1980 he took over El Credito and became a full-time tobacco man. El Credito was a fairly small-time operation in the early 80’s, making mostly short filler cigars and barely squeaking by financially. But in 1992 Cigar Aficionado gave the LGC Wavell a 90 and the business started rolling in. Almost two decades of continued success followed, after which Ernesto sold the company to Swedish Match/General Cigar. In 2009 Perez-Carrillo re-entered the industry with his children as business partners. He wanted to make a cigar that was different from LGC or El Rico Habano, and he was willing to step away from the trend for bigger, bolder cigars. The E.P. Carrillo 2009 inaugural cigar was just that — with an unusual and limited supply of an Ecuador Habano wrapper leaf from ASP tobacco he was back in it again. After that came the “Short Run,” yet another limited edition. The “Core Line” is described by Ernesto as a cross between the Inaugural 2009 Edition and the Short Run, but it presumably will be more consistently and widely available. The wrapper used is an Ecuadorian Sumatra from the Oliva Tobacco Company and the filler is roughly 80% Nicaraguan and 20% Dominican. The Core Line also employs a double binder from Nicaragua. The EPC Core Line opens with a grassy flavor and a dry, somewhat tannic finish. The aroma is very nice from first light though — mild cedar with notes of vanilla and butterscotch. After an inch or so the texture becomes almost buttery. Nutty flavors take over in the mid-section, but the aroma continues to steal the show. It’s floral like Connecticut shade, but woodier. I noticed a touch of salt on the tongue as well. 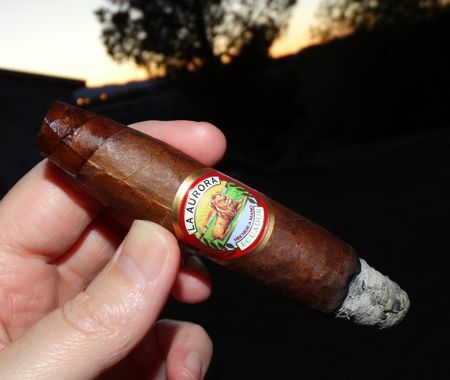 There isn’t a whole lot of complexity to this cigar — the flavors just continue on the same nutty trajectory until they fall just before the band to a prematurely ashy end. 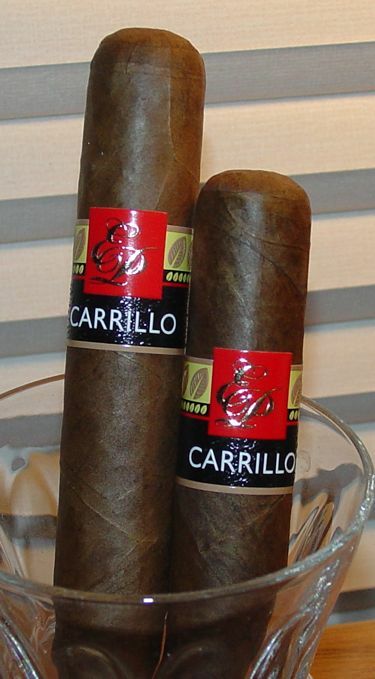 The EP Carillo Core Line is a welcome addition to the medium-bodied cigar market. It could easily be enjoyed as a morning or mid-day cigar, or even a dinnertime smoke if you prefer medium-bodied fare. 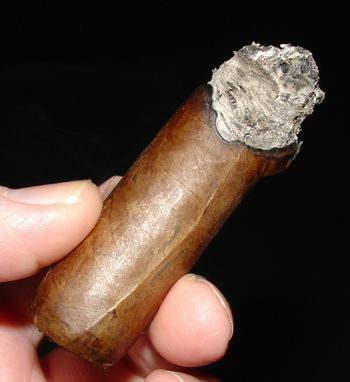 The aroma is expressive enough to compete against most Connecticut Shade style cigars, although it is a bit heavier than most shade sticks. In any case it’s one of the nicer mediums I’ve smoked this year. I just wish it had a little more staying power though the last third. Prices for singles are in the $5 USD range, and boxes run around $115-140. That results in a pretty reasonable price to quality quotient. 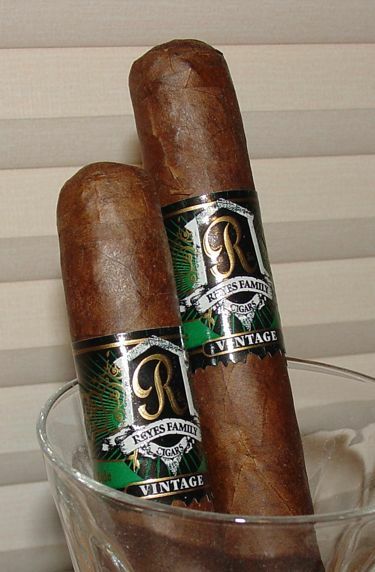 Back in 2008, when the Puros Indios cigar company underwent a metamorphosis to become Reyes Family Cigars, the Reyes Family Vintage was slated to replace the Puros Indios Viejo blend. It wasn’t going to be a new cigar though — the only thing that was going to change was the brand name and its associated bands and boxes. But sometime last year Rolando Reyes, Sr. decided to preserve the Puros Indios and Cuba Aliados names, which has created some temporary confusion in how these cigars are presented. At the moment the Reyes Vintage and the Puros Indios Viejo are two distinct, though similar blends. True to its name, the highlight of the Reyes Vintage line is an aged wrapper — a swarthy Sumatra-seed leaf grown in Ecuador and aged for eight years. (The Viejo has a Ecuadoran Sumatra wrapper that is two years older yet.) The binder is Ecuadoran as well, and the filler is a three country blend from Brazil, Nicaragua, and Ecuador yet again. This is one of the smoothest cigars I’ve smoked in a long time. It starts up with a light woody flavor with a touch of cinnamon or nutmeg and is light to medium in body. 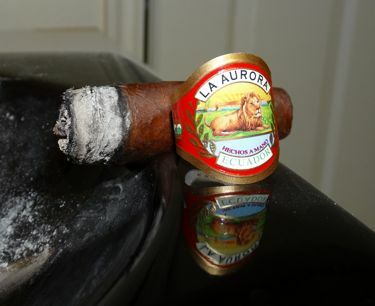 I like the woodsy aroma of this cigar — it reminds me a little of the Cienfuegos line, which is made by the same company. The only criticism I can make about the flavor is that it doesn’t change too much through the duration of the smoke. The Reyes Vintage sidles into its last act with the same tune — smooth and woody, only charring a bit at the very end. It’s not a grand finale, but it’s certainly pleasant. The aged Sumatra wrapper on the Reyes Vintage robusto is superb and it contributes to the exceptional smoothness of the cigar. Construction qualities, aside from a loose flaky ash, were also very good. On the other hand, the cigar suffers from a lack of complexity. In my mind, however, the sweet woodsy aroma of the cigar and its easygoing nature outweigh its simplicity. And what’s wrong with simplicity anyway? Reyes Vintage cigars are packed 15 to the box, which run around 90 USD, or about 6 bucks a stick. If you’re looking for a smooth and woodsy medium-bodied smoke with a stellar bouquet, this is one to try.